Artwork: Yayoi Kusama, Love Is Calling, 2013, wood, metal, glass mirrors, tile, acrylic panel, rubber, blowers, lighting element, speakers, and sound, courtesy of David Zwirner, New York; Ota Fine Arts, Tokyo / Singapore; Victoria Miro, London; KUSAMA Enterprise. 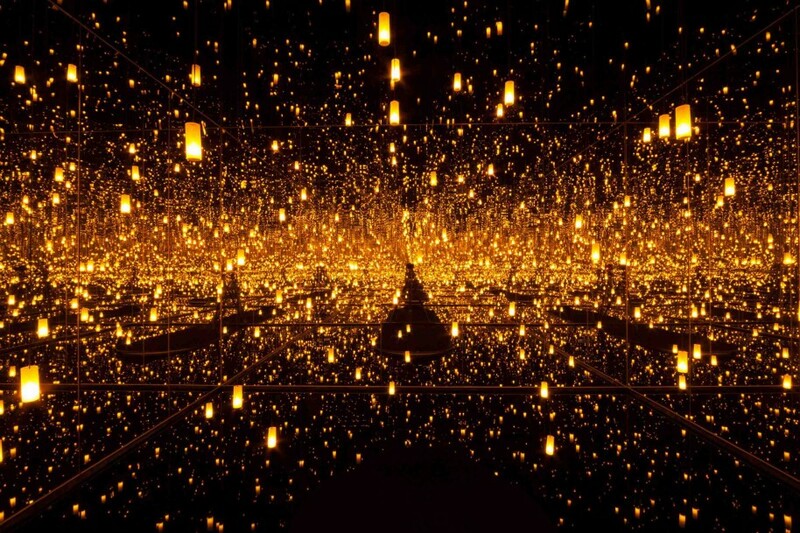 Yayoi Kusama, Aftermath of Obliteration of Eternity, 2009, wood, metal, glass mirrors, plastic, acrylic paint, LED lighting system, and water, the Museum of Fine Arts, Houston, Museum purchase funded by the Caroline Wiess Law Accessions Endowment Fund. Then came the polka dots, which she painted on naked participants in a series of happenings that embraced the counterculture aesthetic and style of the hippie scene. “Since my childhood, I have always made works with polka dots. Earth, moon, sun and human beings all represent dots; a single particle among billions,” she explained. Yayoi Kusama, Love Is Calling, 2013, wood, metal, glass mirrors, tile, acrylic panel, rubber, blowers, lighting element, speakers, and sound, courtesy of David Zwirner, New York; Ota Fine Arts, Tokyo / Singapore; Victoria Miro, London; KUSAMA Enterprise. 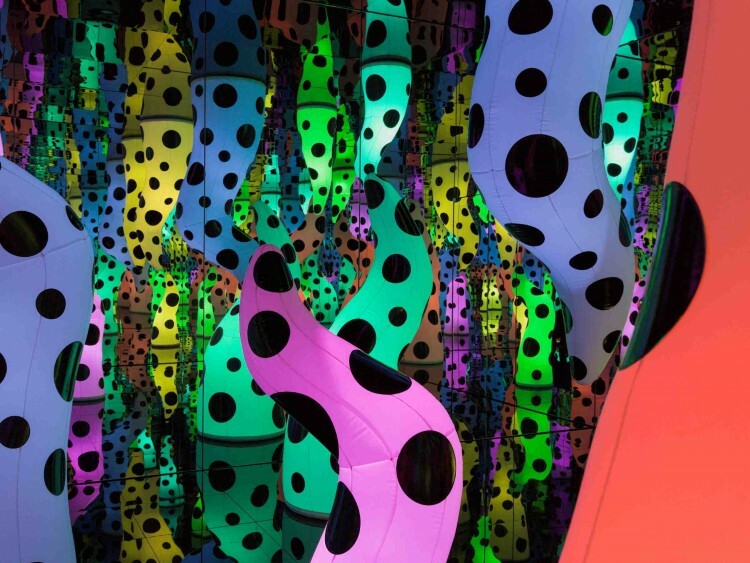 In 1973, Kusama moved back to Japan. Four years later she voluntarily admitted herself to a mental institution in Tokyo, where she has lived ever since. In the intervening decades, Kasuma has become a global legends, becoming one of the most recognized artists alive today, beloved for her ability to mediate the intense sensory experience of life and art into a symphony of light, color, and form that awes and overwhelms. The Museum of Fine Arts, Houston, presents Kusama: At the End of the Universe on view now through September 18, 2016. 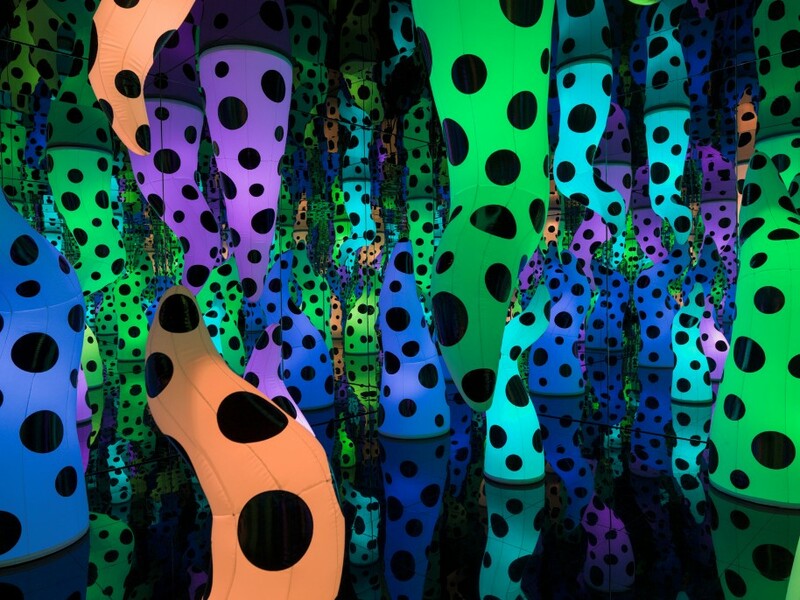 The exhibition features two of the artist’s signature infinity rooms: Aftermath of Obliteration of Eternity (2009) and Love Is Calling (2013), along with a monumental yellow black polka-dotted fiberglass pumpkins. The infinity rooms are lined with mirrors to confound all the visual perception of spatial limits, revealing the beauty of obliteration as it is met with the horror of expansiveness, for what becomes a cosmic spectacle, a metaphor for life and death itself. 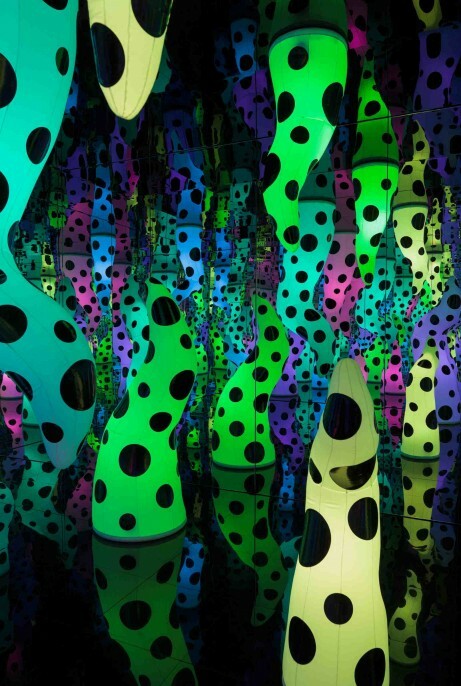 All artwork: © Yayoi Kusama. Courtesy of David Zwirner, New York; Ota Fine Arts, Tokyo / Singapore; Victoria Miro, London; KUSAMA Enterprise.